Welcome to the DoubleTree Suites by Hilton Hotel Naples. Our warm and welcoming all-suite Naples, Florida hotel is perfectly located in the beautiful paradise of Southwest Florida. Naples offers an idyllic retreat for those seeking sun, sea and relaxation. Feel valued and cared for from the moment you arrive at our DoubleTree Suites by Hilton Hotel Naples. Indulge in a delicious warm chocolate chip cookie, straight from the oven when you check in, and make yourself at home in a comfortable and spacious suite.The DoubleTree Naples Florida hotel offers easy access to fantastic dining, shopping and entertainment options in downtown Naples and at the stunning Gulf beaches at Delnor-Wiggins Pass State Park, which is just two miles away. Indulge in authentic Chinese cuisine at our Naples, Florida hotel's onsite restaurants, including Charlie Chiang's, which offers a stylish, modern ambience. Savor signature sandwiches and all-day specials at Café Portofino, which serves breakfast, lunch and dinner.Celebrate a special occasion or host a meeting in our elegant Sorrento Ballroom. Let our services team organize your dream wedding reception in our ballroom or pool patio. Work out in the 24-hour fitness center and enjoy a refreshing swim in our outdoor pool. After a day exploring Naples, relax in a comfortable suite offering all the conveniences of home, with complimentary high-speed wireless internet access and two 37-inch flat screen HDTVs. Upgrade to enjoy large balconies overlooking the pool or the Cocohatchee River. 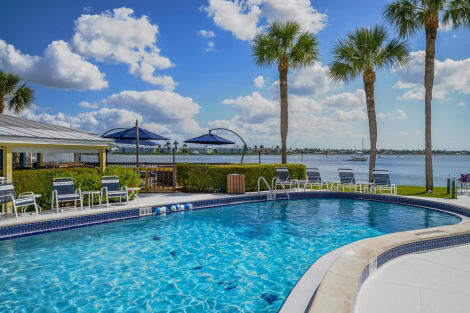 Hotel in Naples FL with Kitchens near Clam Pass Beach Welcome to the Staybridge Suites Naples-Gulf Coast hotel. We are less than 1 mile from Clam Pass Beach and 27 miles from Southwest Florida International Airport (RSW), the closest major airport to Naples, FL. Visitors ready to enjoy the sun will appreciate how close we are to the best beaches in Naples, including being less than 5 miles from Vanderbilt, Lowdermilk and Naples Beaches. Other nearby attractions include the Naples Zoo, Delnor-Wiggins Pass State Park and the Naples Botanical Garden. For a fun afternoon, grab one of our bicycles and pedal the easy, half mile journey to the Waterside Shops. More than 60 luxury shops and restaurants are surrounded by tropical plants and cascading water for a unique shopping experience. Other nearby shopping areas include Mercato and 5th Avenue South, both less than 4 miles from our Naples Florida hotel. Visit the Local Guide page for more things to do in Naples. Our extended stay hotel offers free hot breakfast, dinner and drinks three nights a week and beach chairs. Stay in vacation mode sitting poolside at our outdoor pool and sipping on something tropical from our poolside bar. Each of our Naples Studio Suites have a full kitchen, cookware, utensils, full size fridge, microwave, flat screen TV and sofa sleeper. 1 and 2 Bedroom suites have a separate bedroom with a door and a 2nd TV. 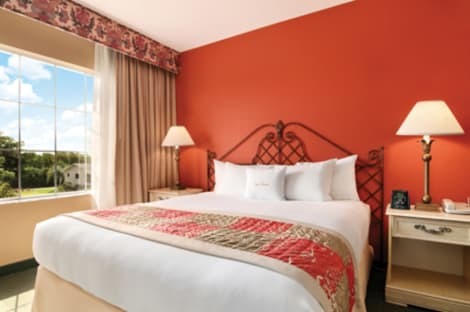 Make yourself at home in one of the 58 air-conditioned rooms featuring flat-screen televisions. Your room comes with a Tempur-Pedic bed. Complimentary wireless Internet access keeps you connected, and cable programming is available for your entertainment. Private bathrooms with separate bathtubs and showers feature complimentary toiletries and hair dryers. Located in Naples (Old Naples), this condo is within a 10-minute walk of Heritage Trail Museum and Cambier Park. This condo is 1.1 mi (1.7 km) from Naples Pier and 2.4 mi (3.8 km) from Naples Zoo at Caribbean Gardens. At Red Roof Inn PLUS+ & Suites Naples, enjoy a satisfying meal at the restaurant. With a stay at La Quinta Inn & Suites Naples Downtown, you'll be centrally located in Naples, within a 5-minute drive of Tin City and Naples Zoo at Caribbean Gardens. 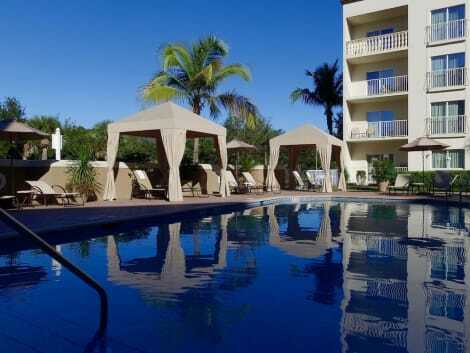 This hotel is 1.8 mi (2.9 km) from Naples Beach and 2.1 mi (3.4 km) from Naples Pier. Featured amenities include a 24-hour business center, complimentary newspapers in the lobby, and dry cleaning/laundry services. This hotel has 3 meeting rooms available for events. Free self parking is available onsite. Stylish Hotel 1 mile away from Naples Beach Front and the Heart of Downtown. Unwind poolside in one of our Cabanas or soak up the sun while relaxing on our outdoor patio. Start and End your day in one of our spacious modern guest rooms, complete with mini fridge, microwave, and 42” flat screen TV. All rooms include FREE Hot Breakfast, WIFI and Parking, excellent for Family, Business and Leisure Travelers. 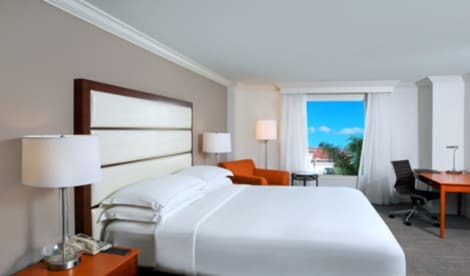 Unwind at Hilton Naples hotel. 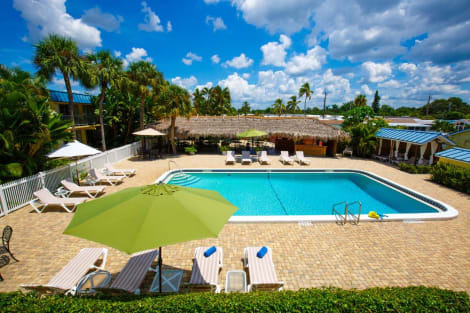 This Naples, Florida hotel’s convenient central location is close to beautiful beaches as well as many attractions, entertainment destinations, shops, and restaurants. Visit the Naples Museum of Art, Naples Philharmonic, the Zoo and more. 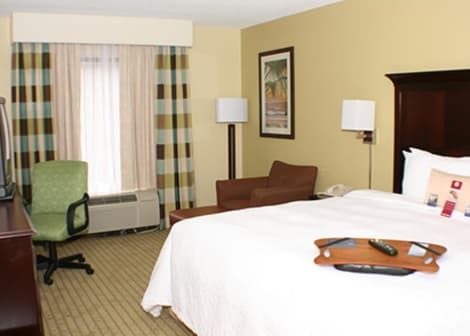 We are located 30 minutes from Southwest Florida International Airport and just 10 minutes from Naples Municipal Airport.Enjoy complimentary WiFi throughout the hotel, and stay productive in the 24-hour business center. Upgrade to an Executive Room or suite and enjoy private access to the Executive Lounge, offering complimentary continental breakfast and evening hors d’oeuvres.Plan your dream wedding in Naples FL with a Hilton hotel wedding coordinator. Host corporate functions and special events for up to 600 guests in this Naples hotel’s meeting and banquet spaces. Take the complimentary shuttle service to the nearby beach and relax with a complimentary beach package, including beach chairs and cooler with bottled water and ice. Rejuvenate in the outdoor heated pool or refresh in the hotel’s whirlpool. Admire the pool’s waterfall while enjoying poolside dining. Work out in the 24-hour fitness center.Explore Naples with complimentary bicycle rental from Hilton Naples hotel reception. Play table tennis and challenge the family to basketball on the hotel courts. Dine at the multi-award-winning Shula’s Steak house; savor succulent steak while admiring the 1972 Miami Dolphins themed decor. Discuss business over dinner in one of our restaurant’s private dining areas or treat your loved ones to a delicious meal. lastminute.com has a fantastic range of hotels in Naples, with everything from cheap hotels to luxurious five star accommodation available. We like to live up to our last minute name so remember you can book any one of our excellent Naples hotels up until midnight and stay the same night.